fpd files from Oakley (some module names shortened). It has external cv and gate inputs for 3.5mm patch leads added , I laid out the leds vertically and moved midi sockets to the right. Mults are passive at the moment but later might add active. I had planned to go for the modern bare aluminium livery ..but decided ultimately that the classic look was deserved. I paced myself to one module a week ..so 10 weeks approx to complete. First wiggle of complete system today. like to thank Tony again for his support. Very nice! Congratulation on a good system! You use the "drive" pot to subtly add soft overdrive, to get slightly more overtones/high frequencies, but it also changes the sound somewhat. It is not dramatically, it is more a fine shading of the sound, which is why you need a pot and not a switch, so you can choose the amount of change you want to dial in. What knobs are you using for the small knobs? terjewinther ..thanks for the advice on the drive knob, i hear the changes ..mostly at the ccw 6-11 oclock ..then past 12 it gets quiet ..so i suspect i must experiment with inputs and input levels. Its good to know it is working as it was designed to. they match #17466 " BS Knob large "
eljay gets the credit for picking parts ...I used his parts spreadsheet. As to the best positions i had a shortlist of three arrangements to begin with and pondered for an hour over the best ..Ill try yours next iteration of moves. I think i chose well for a small starter system. Congrats on the beautiful build. I am looking at doing something like this myself for my first modular setup. Nice system! 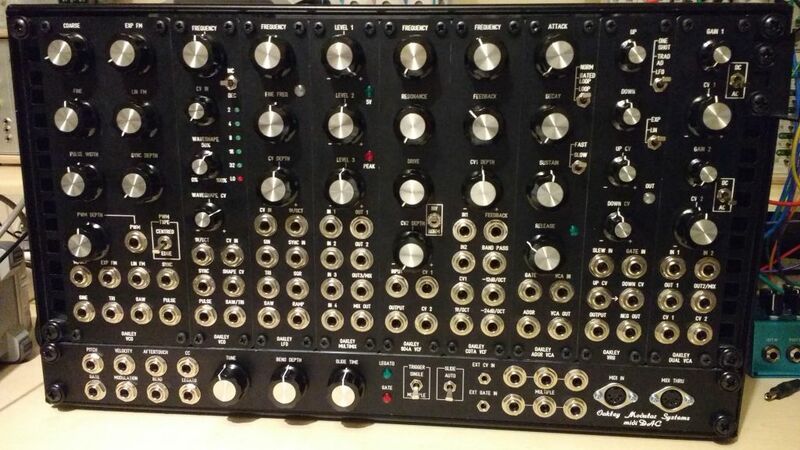 Sometimes I wish I could expand my 5U, MOTM format modular, which has a good number of Oakley modules. Alas, I've run out of room. Wish I had a pair of VRG. Still, I'm happy with my OMS-820s! Buy or build a new case? If someone would like to buy my two Oakley VC-ADSR-VCAs, I would have room to add some more Oakley! I ended up with too many ADSR modules, and these two don't get a lot of use. 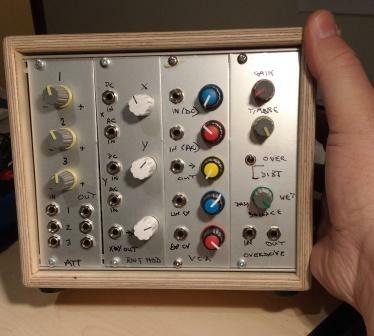 for fun - i thought i should show everyone my oakley eurorack build ..the sharpie scribble may have to go..its slapdash. Oh on the left is a diy triple polar attenuator then the oakley ring mod , classic vca and overdrive. Cool system were the modules hard to build? The oscillator specifically, what did you need to calibrate it and was it difficult? I'm thinking of planning a single-manufacturer modular with the possibility of DIY once I'm done with my 6U eurorack. Oakley seems to be one of the more interesting options, but the power-supply and perhaps also VCO:s might have to be factory-made since I'm quite new to DIY. The build guides make these modules easy to build with basic soldering. The Psu and oscillator PCbs are neither more or less difficult. Go look at he build guides and read them twice over to get comfortable there are no gotchas you miss. These are rare but occasionally some components are not fitted or have alternatives. If you can afford to have the panels made for you using the templates provided that gives you the assurance it all comes together. Calibration of Osc and what u need is described in the user guide for the Osc...You do not need expensive oscilloscope to get a reasonable calibration. I would not say mine is perfect, but it's fine for me..tracking over 88 note. Keyboard without hearing any off tuning. That said ..buying 5u module is closer to the build cost of diy than my experience of Eurorack where diy is cheaper than build..I have 9u euro purchased over 2 years...but that is just a subjective viewpoint. Thanks for the info! Sounds like I could manage to learn how to build the whole thing then, but I'll have to think about if I really enjoy the building enough in itself if the price difference is even lower than in eurorack... maybe I'll just have krisp1 put together some modules for me instead.